Last week was my five-year post-op appointment, and I just wanted to say thank you for the excellent care I have received. Five years ago, I was a timid, insecure twelve-year-old who was absolutely terrified at the thought of surgery. With my swimming times improving and the absence of pain, I did not understand the seriousness of my progressing scoliosis. 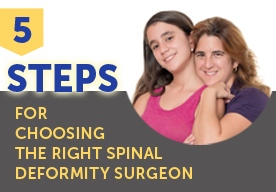 After undergoing the surgery at St. Louis Children’s Hospital, it is now clear that this procedure was critical for a happy and healthy future. Although my memories in the hospital are vague, I will never forget Dr. Lenke’s friendly smile and the nurses’ ability to make me feel comfortable. With my senior year of high school approaching, I am already looking forward to finding a college and pursuing a career in government. The surgery gave me the confidence—both physically and mentally—that I can always do my best despite the circumstances.